26 May 2017, SINGAPORE | Kult collaborated with local production house, Design and Print International (DPi), to launch a new merchandise collection. Kult Kollab translates art from street artists around the world into wearables, pushing the boundaries of art and fashion. The launch took place as part of Multiply: A Majestic Playground from 26 to 28 May at the New Majestic Hotel. Kult Kollab dares the masses to be bold, allowing themselves to break free from their comfort zones and wear their [he]art on their sleeves. “The art at Kult has always been spirited and unapologetic. We constantly look to explore expressing this in different mediums beyond a canvas or print - that’s when the idea of wearable art came. This collection aims to be the enabler for the fire in all of us, no matter how small the spark,” said Raja V, Director of Kult Studio & Gallery. The creative team headed selection of the artworks, choosing ones that conveyed Kult’s energy and edge. “It was intensively challenging – like making us pick our favourite kids! As our database is really extensive, with fresh art from urban artists all around the world, we decided to select pieces that have bold colours and imagery that really pops out. We want the art to be the first thing you spot in a crowded space,” said Kult’s Art Director, Alicia Wee. The collection features a total of seven items – three t-shirts, two dresses and two caps. While creating new platforms for artists, Kult also aims to make art more accessible and affordable for all. To help realise this, DPi’s keen expertise in production played a big role in the process. “We’ve always been drawn to bold ventures and with Kult, we found the perfect partner. We’re making a statement through Kult Kollab, in its unique style and high quality range of limited edition clothing and apparel. Combining our ability to translate creativity into production with Kult’s array of talents, we have every faith it’s going to be a hit,” says Richard Matthews, Managing Partner of DPi. The collection launched to excellent feedback at Multiply: A Majestic Playground by Straits Clan & Keepers during the two-day event at New Majestic Hotel. From 27 to 28 May, attic suite room 404 of the historic building was transformed into a vibrant showcase of the series. 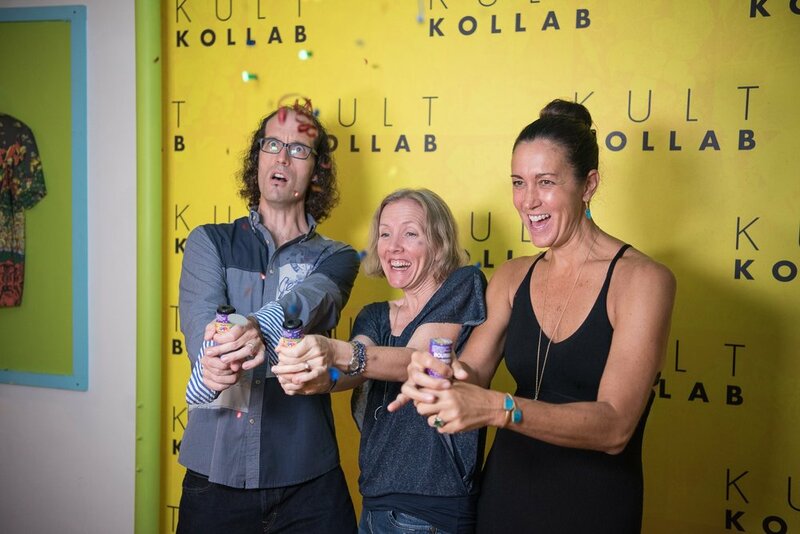 A highlight of the launch was “Triple Dare”, a slow-motion photo booth. Before entering the photo booth, participants were randomly assigned 1 of 3 'extreme photo booth experiences'. They either got confetti bombs, got blasted with water guns or were blown with a wind machine. The result was laughter and a memorable gif to remember the event by. To purchase from the Kult Kollab series, click HERE.